You can watch the showdown between the two best wrestling teams in the state when Holy Cross hosts Brother Martin starting at 6 p.m. Wednesday at Holy Cross on CrescentCitySports.com. Ken Trahan will have the call of the action, presented by Campo Better Living, Appliances, Home Theater and Security at 3020 Clearview Parkway in Metairie. Holy Cross has won 28 state championships, the most in state history, including the Division I state title in 2017. 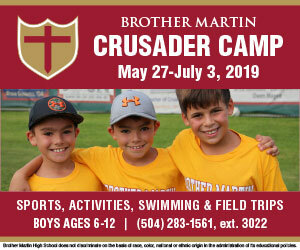 Brother Martin has won 18 state championships, including winning the Division 1 title in 2018. The Crusaders of Robert Dauterive have won six of the last seven Division 1 state titles. Brother Martin is led by four returning state champions including Connor Hoffman, who is wrestling at 120 pounds, Daniel Croy at 132, Patrick Evans at 145 and Mack Brown at 285. Another outstanding wrestler for Brother Martin is Alex Duncan, wrestling at 138, who finished fourth in state a year ago. Mason Massicot, who will wrestle at 160, was a state runner-up a year ago. Kyle West finished fourth in the state last season at 220 pounds. Holy Cross is led by first-year head coach Nick Michael. The Tigers’ top wrestlers include undefeated freshman Evan Frost (106), returning state finalist Jacob Frost (113), defending state champion Michael Lundin (126) and returning state finalist Caruso Signorelli (132). Logan Lacoste (138) was fifth in state a year ago while Brady Butler (152) was a third-place finisher in state last season. Mason Macaluso (160) finished sixth in state last season and Caden Mumme (182) was a third-place finisher.